The morning got off to a late start but all went good got my limit by 11am. The parts of my outboard came in the mail today so I can get that put back together tonight.The boys floated the creeks but only got one so I am going to take them out this afternoon. great stuff. take camera with you this arvo so you dont get bored. Ended the day with 17 ducks, one shy of our limit. Not a bad day. That is an awesome day out with the boys Wiersay...and 17 is a damn fine tally mate. Well done buddy. Pretty slow today only one teal and a goose. I should have had another duck the second goose, but I left them for another day. Nothing wrong with leaving some "breeders" mate...good sense in my book. Dang 17 the other day and a few more later!! Excellent hunting for you and your boys. Yea Omni I am sure not going to complain about all the birds I have been seeing, especially since they have been falling from the sky. Saturday was a quick morning. 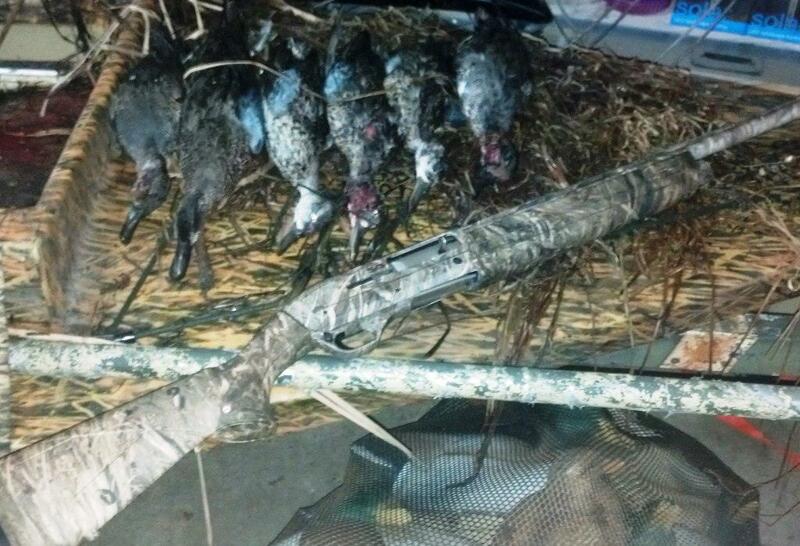 The first flock of Teal was 4 birds for 3 shots. ended up getting my limit within a half hour. I guess you like the new shottie then!!!! You have a duck plucker wiersy? I skin all my birds. I never have liked the skin on ducks. Nice hunt on the teal. I'll leave the skin on a few nice mallards when and if I get them. Really like them baked with the skin on.